Found as a free download at the Kindle Store. Great writing in a typical, formulaic fiction/mystery book. Carella knows how to compose a tale that captures your attention. I was hooked from the first page. There was no overflow of exposition that some writers fall back on when they can’t find a plot, subplot or characterization. Carella describes and shows time and place, then gets on with the tale. Speaking of characters, the main one, Jamie, feels a bit too contrived-all goody two shoes, a virgin who almost feels like a nun. Then there are the typical bad guys, fiancee tom and outsider carrie. Finally, the brother who can’t seem to make up his mind to be good or bad at first. The parents are one-note characters and you’re secretly glad that life is hard for them. 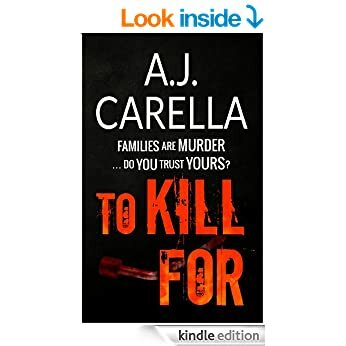 The plot is formulaic, A+B+C=Death, but Carella uses language to ensnare the reader so as to keep reading, even though everything is already spelled out for you. The ‘surprise’ in the middle of the book with Jamie feels out from left field, though I do admit. I didn’t see that coming and thought the plot was headed 180 degrees from where I thought it was headed. Kat felt so out of place in this storyline, I had forgotten that she was the focus of the book, even though Carella makes her the main plot point in the book’s description. She’s never mentioned by the parents, even casually, so when the plot turns, it feels like a separate book entirely. I would suppose this is the base for a long series by Carella. I would give 3 1/2 stars.